You can buy all sorts of different brands of granola. Granola comes in bags, boxes or bulk. It is found in the cereal aisle, the health food store, and the corner market. But, the best granola is the stuff you make yourself. Why would you waste your time making it when you can buy it? Simply, the taste. You can control all the ingredients, including how sweet you want it, the nuts and berries in it - and the taste is amazing. After making this, you will NEVER buy commercial granola again. Commercial granola just doesn't compare and it isn't worth the calories. Granola, while nutritious, is not a low calorie food. Do you want to spend those calories on something delicious or something mediocre? How does homemade granola compare to Chewy Granola Bar? The calories are the same, but the ingredients can be very different. You can control how much sugar and what type of sugar is in your snack. This homemade granola recipe is adapted from a great kids cookbook. Molly Katzen's, "Salad People", starts at preschool age and is a great way to introduce children to cooking. Preheat oven to 325 F. Line a large rimmed baking tray with foil and spray with non-stick spray. Combine the oats, nuts, and sugar in a large bowl. Mix the canola oil and honey and pour onto oat mixture. Spread on baking sheet and bake for 30 minutes. After it cools, add the dried fruit. 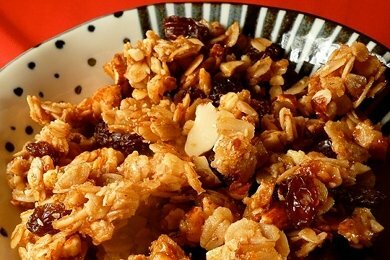 Most schools no longer allow snacks or lunch with nuts, so one great reason to make your own granola is you can leave out the nuts -- add more dried fruits instead -- and then your kids can bring it to school either as a snack, or for lunch. It is great with yogurt. Put plain yogurt in a thermos and the granola in a baggie, and then your child can mix them for a yummy yogurt lunch that does not have all the sugar and artificial additives of commercial yogurt.